Imtiaz Muqbil was the only travel industry journalist invited to cover this historic event. 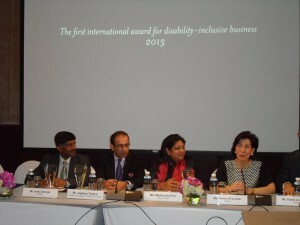 Bangkok, Dec 3, 2013 – The Holiday Inn Singapore Orchard City Centre became the first hotel winner of a newly launched award to recognise Asia-Pacific companies creating meaningful jobs for Persons with Disabilities (PwDs). 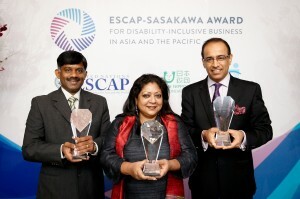 Two other winners of the ESCAP-Sasakawa Award For Disability-Inclusive Business in Asia and the Pacific were the Indian information technology company Wipro and the Indian enterprise Trash to Cash. Conferred on the International Day of Persons with Disabilities (Dec 3), the award was established by the Bangkok-based UN Economic & Social Commission for Asia and the Pacific (UNESCAP), the Nippon Foundation (TNF) and the Asia-Pacific Development Center on Disability (APCD). Launched in the first year of the UN’s Asia-Pacific Decade of Persons with Disabilities, 2013-2022, it will now be an annual award aimed at businesses and enterprises in the region’s 58 U.N. member countries and territories. Mrs. Nanda Krairiksh, Director of ESCAP’s Social Development Division, said 70 applications had been received for this year’s awards. She said that plans for next year’s awards included translation of the application forms into other Asian languages in order to attract more entries. In her opening remarks, Mrs Nanda noted that PwDs account for 15 per cent of the world’s population, with over 650 million in the Asia-Pacific region alone. She said Disability-Inclusive Business is a pioneering concept that views PwDs as an untapped workforce and a market with significant purchasing power. She noted that the awards were in line with the “Incheon Strategy to Make the Right Real for Persons with Disabilities in Asia and the Pacific” approved at a high-level meeting in Korea in November 2012. This strategy provides the world’s governments with the first set of goals and a specific time-frame to promote the rights, and enhance the quality of life, of the growing number of PwDs. 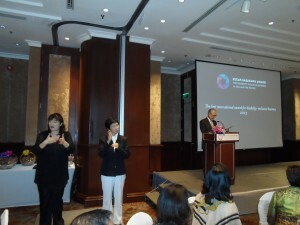 The speeches at the opening ceremony were tinged with deeply personal reflections about the challenges faced by PwDs. Dr. Noeleen Heyzer, the ESCAP Executive Secretary and Under-Secretary General of the UN, is recovering from a foot operation and walks slowly, with the help of a cane. As she still maintains a full travel schedule, she said she now has to make a special effort to check out facilities for PwDs at airports and hotels. Former Thai Prime Minister Mr. Anand Panyarachun said his wife has been a wheelchair user for the past few years. “Her disability has made me understand more deeply the day-to-day challenges that persons with disabilities face in their daily life. My wife is constrained from the simple enjoyments of life. It is difficult for her to travel, shop or go to a restaurant due to physical barriers. As Prime Minister between 1991-92, he said, “I was proud to have overseen the passing of the first national law on disability in Thailand, the Rehabilitation of Disabled Persons Act of 1991. This Act promoted greater livelihood opportunities for persons with disabilities and also the improvement of public accessibility through new regulations for buildings and services. (Scroll down for full details of the award winners and texts of speeches by Mr Anand and Dr Heyzer). He called for PwD education to be imparted in every school in Thailand; for Thai banks to provide special loans to PwD entrepreneurs; for the creation of more awards to recognise PwD-owned and –operated businesses; and for more companies to hire more PwDs and help them start their own businesses. “Persons with disabilities should be employers not just employees,” he said. He also chided the Bangkok Skytrain mass transit system for not having PwD-friendly facilities at all its stations. Mr. Jagdeep Thakral, General Manager of the Holiday Inn Singapore Orchard City Centre, said hiring PwDs made sense in view of the labour crunch in Singapore. 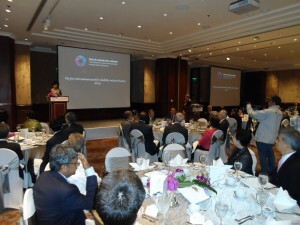 He complimented the Singapore government for its extensive support for the hiring and training of PwDs nationwide. Mrs Puri, whose enterprise will get a US$50,000-100,000 cash grant, said she will use the funds to expand the project to 10 cities in India, creating jobs for another 5,000 PwDs. The travel & tourism industry is set to be a primary future focus of the awards. 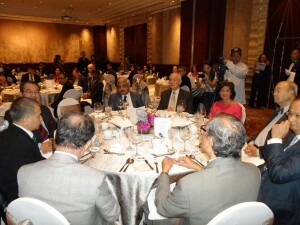 The ceremony had an entire table occupied by general managers from a number of top Bangkok hotels. Mrs Nanda said there had been a lot of good applications from India, a country that is now paying heavy-duty attention to job-creation for PwDs. Next year, Vietnam has offered to host the awards ceremony, and moving it around various countries would be a good idea in order to promote the advocacy message, she said. Established in 1946, Wipro is a global organization focused on information technology, consulting, business process outsourcing, engineering, customer care and lighting. Wipro has over 145,000 employees serving global clients, and is headquartered in Bangalore, India. Wipro helps customers to do business better by leveraging its industry-wide experience, deep technology expertise, comprehensive portfolio of services and a vertically aligned business model. Wipro is globally recognized for its innovative approach towards delivering business value and its commitment to sustainability. Wipro champions optimized utilization of natural resources, capital and talent. Disability-Inclusive Initiative Wipro has been hiring persons with disabilities and supporting them to realize their full potential. In addition, Wipro has also supported employees who have acquired a disability during the course of their employment to enable them to continue building meaningful careers. Currently Wipro employs over 450 persons with disabilities. Its philosophy is to enable careers. Many ofthese employees hold responsible positions in mainstream business activity, and are encouraged in their career ambition. Wipro adopted a comprehensive framework in 2009 to enable an equal opportunity environment for persons with disabilities. Wipro has introduced several initiatives to support the careers of persons with disabilities. These include making physical and digital infrastructure accessible, transforming software applications to suit people with disabilities, designing more inclusive training programs, making its training programs inclusive and building awareness through campaigns. Today Wipro’s inclusive initiative is an integral part of its sustainability movement. Wipro’s efforts within the organization and outside are part of a deep belief that inclusion is the right thing to do and should be a way of doing business. Nupur is a dynamic young leadership trainer at Wipro. She joined Wipro as an applied behavioral researcher five and a half years ago. Nupur joined Wipro from management school while pursuing her postgraduate degree and appreciates Wipro’s equal opportunity policy. “When I was invited to take a written test, along with other candidates, I requested for an alternative testing method. Wipro quickly arranged for me to answer the questions in interview format instead,” says Nupur, who is visually impaired. She passed that and all subsequent interviewing stages and received an offer from Wipro, arguably one of the challenging and professional employers in India. “I love research and playing with data,” she says, and goes on to describe a research project she is now undertaking to measure the impact of persons with disabilities on team productivity. “I use a combination of quantitative and qualitative data, including 360 degree evaluations and interviews.” Nupur has done well in her career. “I love research and am also a people’s person,” she says. So when the opportunity arose to become a leadership trainer for Wipro’s senior management, she jumped at it. She quickly won the confidence of her managers and also receives excellent feedback form trainees. Nupur is not just a smart, talented trainer and an analyst, she is also an avid adventurer, who loves rock-climbing and bungee jumping. She is also the mother of a 20-month-old child. On 3 December 2013, Nupur would also receive the 2013 Role Model National Award, from the President for India, in the visual impairment category. Established in 1985, Holiday Inn Singapore Orchard City Centre is a brand of the Intercontinental Hotels Group (IHG), one of the world’s leading hotel companies. Since 1991, the hotel has been employing persons with disabilities. In doing so, it has taken a unique approach to the employment of persons with disabilities and has built a complete back-end ta lent pipeline. It works with special schools to build skills of students with disabilities and prepare them for real job opportunities in the hospitality industry. In 2006, the hotel formed a partnership with a local special needs school, Delta Senior School. In 2010, Jagdeep Thakral, General Manager of the Holiday Inn Singapore Orchard City Centre, was appointed as executive member of the Enabling Employers Network (EEN), established by the Ministry of Community Development Youth and Sports. The hotel was selected as one of the training centers within the framework of this network to train persons with disabilities and prepare them for the job market. Today, 13 per cent of the hotel’s workforce consists of persons with disabilities. They are placed in various roles including stewarding and kitchen, as well as guest facing roles such as housekeeping, business center, bell desk, and food and beverage outlets. The hotel intends to increase the current share of employees with disabilities to 20 per cent in the next three years. Hiring persons with disabilities and providing long-term sustainable live lihoods has proven to be a mutually beneficial business model for the hotel and is in line with the company’s overall vision. Teck Wee has been working as a kitchen porter and a cook at the Holiday Inn Singapore Orchard City Centre for the past six years. Teck Wee has an intellectual disability. This is his first job, after finishing at the Metta School for special education in Singapore. Holiday Inn Singapore Orchard City Centre creates a safe space for employees like Teck Wee to use his creativity in cooking. Through his culinary work in the hotel, he has gained confidence and made good friends with a number of his colleagues. “I often meet our hotel guests and they are happy to see me when I serve croissants for breakfast,” he says. Teck Wee says time passes fast while he’s working, and this satisfaction makes him happy. He hopes to continue cooking, wants to travel around the world and learn to draw. Established in 2008, Trash to Cash transforms trash into consumer products. Its core business is to recycle temple flowers into colored powders, thus reducing pollution in rivers where the flowers are traditionally disposed. It also converts surplus and waste material from factories, offices and homes into market-worthy products. The majority of this work is performed by persons with disabilities. Since its establishment, the Trash to Cash business model has been built on the ability perspective, viewing the strengths brought in by persons with disabilities as its greatest resource. As a result, 65 per cent of Trash to Cash workforce consists of persons with disabilities. Another 30 per cent are persons who were living in poverty or who had received little or no education. Since its establishment, Trash to Cash recognized a unique business opportunity. Its core values are to provide employment opportunities for persons with disabilities and contribute to environmental sustainability. This business model is not only profitable; it is also sustainable, as demonstrated by the business’ survival and growth in the years since its establishment. As part of the Award, Trash to Cash will receive a grant of between USD 50,000-100,000 to scale up its business model in 10 other cities in India. For the past three years, Bahadur has been working as a computer and documentation officer at Trash to Cash. Bahadur is a wheelchair user and this is his first job. He was hired after attending a 3-month computer training at a government school. He also wants other companies to follow in the footsteps of Trash to Cash. “I would like to encourage companies to employ persons with disabilities”. In addition to the three winners, the following businesses were awarded “Honorable Mentions” in the 2013 ESCAP-Sasakawa Award for Disability-Inclusive Business in Asia and the Pacific. A pioneer in the IT industry, Capgemini has over 45 years of global expertise collaborating with leading corporations and now brings consulting, technology and outsourcing experience to India. Capgemini is committed to equality of opportunity and dignity at work for all, “irrespective of caste, religion, race, colour, creed, ethnic or national origins, gender, marital status, sexuality, disability, class or age”. This human-centered approach, which provides equal opportunity to all, is essential to Capgemini’s success. With this deeply set belief, the inclusion programme in India was started to provide a non-discriminatory environment to persons with disabilities through the entire employee life cycle. Genashtim Innovative Learning provides on-line learning services for executive education and language proficiency, and additional services such as remote PC support and remote surveillance center. They operate in more than six countries with clients including prominent multinational companies like ABB, McDonalds, and Regent Hotels, and prestigious academic institutions. Genashtim has built business and work processes that allow persons with different disabilities to complement each other to deliver world class services at very competitive prices. It currently counts 80 per cent of their permanent staff and 20 per cent of their hourly-paid staff as persons with disabilities. More significantly, most of their clients are not even aware that Genashtim hire persons with disabilities-they are clients purely because Genashtim delivers a good service at a competitive price. Since 1976, ORBIT has been the only company in India that runs engineering workshops for the blind in Trichy and Rani pet in the state of Tamil Nadu, enabling ORBIT to prove to society that even the blind can do engineering work. Of its present workforce, 80 per cent are visually challenged, 10 per cent are physically challenged and only 10 per cent are without disabilities and work in office management. In this way, ORBIT has enhanced the status of persons with disabilities and given them an opportunity to support their family members. System 5 operates under the DKC trade mark to be one of the key producers of metal wiring goods (e.g. trays, enclosures, accessories) in the Russian Federation. The company attributes the hiring of persons with disabilities with overall increases in labor productivity where their high standard of work is a motivational force for other employees. Persons with disabilities are actively engaged in all corporate events and the company has ensured that all regulations and personnel policies are tailored to ensure they are barrier-free. Over the past five years, Systema 5 has employed 16 people with disabilities and disperses any associated tax savings they receive for their hiring policies directly back to their staff with disabilities in recognition of their value to the company. Yum! Restaurants International (Thailand) owns, manages, and awards franchise licenses to the KFC and Pizza Hut restaurant chains in Thailand. Yum! Thailand has over 500 restaurants in 74 provinces across Thailand. The ‘We Hear Every Dream’ is a project at KFC, with an aim to provide equal opportunities to persons with disabilities, which started at KFC Times Square outlet in 2012. With a firm belief that a life that’s not “complete” doesn’t mean a life deprived, KFC are confident that those who are deaf to the outside world are better able to hear their hearts’ desires, and have the inspiration to pursue their dreams. The hearing-impaired staff are extensively trained on how to take orders and understand customer preferences. The ‘We Hear Every Dream’ project is giving the hearing-impaired opportunities to do jobs for helping themselves and their families to better their lives, whilst also strengthening business ties with customers and suppliers who are more than willing to support innovative and inclusive products and services. Special Mention The following organization was awarded a special mention for achievement under challenging circumstances in the 2013 UN ESCAP-Sasakawa Award for Disability-Inclusive Business in Asia and the Pacific. Golden Taj Ball Company (GTBC) is based in Kabul and produces sports equipment, namely footballs and volleyballs. The work process involves workers who are mainly poor women, especially women heads of household in remote areas of Afghanistan, who either have disability themselves or one or more of their family members have a disability. An accessible workplace, combined with the skills and application of persons with disabilities, has enabled the company to develop a wide range of products that increases each year. The company currently employs 649 people as skilled and unskilled workers, with 68 per cent of employees representing those families headed by a person with a disability or with one or more family members having a disability. The production process for ball making only requires the use of two hands to stitch a ball. Those who have lost one or both legs can therefore work and be provided with a regular income. APCD is a regional center on disability and development located in Bangkok, Thailand as a legacy of the Asia and Pacific Decade of Disabled Persons, 1993-2002, by the United Nations Economic and Social Commission for Asia and the Pacific (ESCAP). APCD was established under joint collaboration of the Government of Thailand through the Ministry of Social Development and Human Security, and the Government of Japan through the Japan International Cooperation Agency (JICA). APCD is managed by the Foundation of Asia-Pacific Development Center on Disability (APCD Foundation, established in 2003) under the Patronage of Her Royal Highness Princess Maha Chakri Sirindhorn. More than 2,400 participants from all over Asia and the Pacific have participated in APCD’s international training. APCD has been endorsed by the ESCAP as a regional cooperative base for an inclusive society in the Asian and Pacific Decade of Persons with Disabilities, 2013-2022. Through the ESCAP’s Incheon Strategy to “Make the Right Real” 2013-2022, APCD is called upon to continue building the capabilities of persons with disabilities and multi-sectoral collaboration, with special attention to encouraging private sector engagement in disability-inclusive business that promote disability-friendly products, services, employment opportunities and entrepreneurship development. I believe this Award is an important advocacy tool to demonstrate the leadership potential of the private sector to address the challenges faced by persons with disabilities and, at the same time, improve the market shares of their business. As some of you may be aware, I have a deep personal interest and commitment to promoting a disability-inclusive society. My father was instrumental in the founding of the first school for the blind in Thailand, in 1939. Whilst in office, I was proud to have overseen the passing of the first national law on disability in Thailand, the Rehabilitation of Disabled Persons Act of 1991. This Act promoted greater livelihood opportunities for persons with disabilities and also the improvement of public accessibility through new regulations for buildings and services. And together with Senator Monthian who is with us here today, I am also proud that we were able to enshrine the rights of persons with disabilities for the first time in Thailand in the 1997 Constitution in my capacity as the Chair of the Constitution Drafting Committee. That was over 15 years ago. Now, the issue of disability has become even more profound. As we saw in the film just now, the rapid pace of population ageing in Thailand, and in other parts of Asia-Pacific, will increase the number of persons with disabilities significantly. At a personal level, my own wife has been a wheelchair user for the past few years. Her disability has made me understand more deeply the day-to-day challenges that persons with disabilities face in their daily life. My wife is constrained from the simple enjoyments of life. It is difficult for her to travel, shop or go to a restaurant due to physical barriers. Her situation has also made me recognize the vast opportunities that exist for the private sector to service this undervalued market. In this regard, societal changes present a real opportunity for innovative businesses to reap the rewards of expanding their markets to the fast growing disability community. It therefore makes economic sense for companies to make their businesses more disability-inclusive. And it is also the right thing to do – why should 15 per cent of our population be denied the same rights and enjoyment from life as everyone else? I therefore look forward to drawing inspiration from the innovation and leadership of the winners of the ESCAP-Sasakawa Award that will be announced shortly. We have several business leaders in this room. I hope that you will realize the potential of disability-inclusive business to make a difference that is profitable for all of society. To the media gathered here, I also urge you to spread today’s messages to the four corners of Asia-Pacific and beyond. On my part, as Chairman of the Board of the Siam Commercial Bank, I intend to explore how we can make the Bank more disability-inclusive. In closing, let me congratulate ESCAP, the Nippon Foundation and the Asia-Pacific Development Centre on Disability for establishing this important Award for the Asia-Pacific region. Together, we can catalyze regional leadership in disability-inclusive business. Today is a very special day. We are gathered here from all sectors of society to promote the rights and opportunities for the 650 million persons with disabilities in the Asia-Pacific region. The ceremony for the inaugural ESCAP-Sasakawa Award for Disability-Inclusive Business in Asia and the Pacific is being held today to mark the International Day of Persons with Disabilities. The private sector has a crucial role to play in these efforts, in promoting disability-friendly products, services, employment, and entrepreneurship development. Almost one in five of your customers have a disability. They represent a significant resource to tap new skills and markets. By addressing the needs of persons with disabilities, we can lift people out of poverty and provide them with a dignified life, while developing new – and expanding – market shares. That is why the “disability-inclusive business” model carries the promise of shared prosperity. 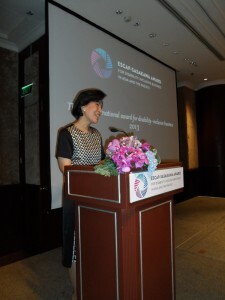 It is also the reason why ESCAP, the Nippon Foundation, and the Asia-Pacific Centre on Disability jointly established the ESCAP-Sasakawa Award to recognize businesses that have responded to the demands of persons with disabilities by integrating universal design into their product development, and by engaging and hiring persons with disabilities in their day-to-day business operations. Private sector leaders in this region, and beyond, have shown it is possible to employ persons with disabilities in a manner that spurs innovation, improves morale, increases productivity, lowers turnover, and improves the bottom line. In particular, multinational enterprises, whose scale of business operations have far-reaching impacts upon both markets and the lives of the persons they employ, can serve as powerful drivers of disability-inclusive business. In no industry is this better captured than in the information and communications technology sector – renowned for its dynamic pace, emerging technologies, and tremendous opportunities for growth.